Actually, it's an ester from the jojoba plant. It's not really an oil at all. It is best for you in my daily work with hot stones and essential oils. That's the short answer. The longer answer is because it won't turn rancid, and that's because it's not really an oil. It's an ester, extracted from the jojoba seed. It conditions your skin and allows me to concentrate on your muscle and pain issues rather than wondering if you'll break out because of chemicals and additives that is put into other massage gels and oils. It washes out of clothing and linens with hot water and detergent. If used appropriately, the product will stay in the skin and will not come out on linens or clothing. For more on this, see our Laundering Instructions. Finally, you won't need to towel your clients off when the massage is over. You will find yourself using measurably less HobaCare Jojoba than other products. A therapist giving 30 to 35 massages a week customarily uses three to four gallons of our product a year. Hot stone modalities will require more. Massage Therapists interested in integrating aromatherapy into their practices need to do more than cursorily review available, pre-packaged aromatherapy products. They need to educate themselves about the aromatherapeutic effects of specific plant essences on the emotional, psychological, physical, and mental states of their clients. We encourage all massage therapists with a genuine interest in aromatherapy to read deeply and to learn as much as they can about this increasingly important field. Our Bibliography is a good place to start. A second starting place is the National Association of Holistic Aromatherapy (www.NAHA.org), which is a wonderful source of knowledge." 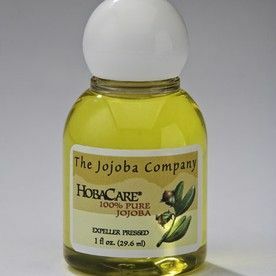 "HobaCare Jojoba is a "fixative". While it has a mild, almost imperceptible scent of its own, it takes on the scent of its immediate environment. After HobaCare has been in your skin for a minute or two, you will not perceive its scent, only your own. Likewise, HobaCare Jojoba fixes, or makes permanent, the scent of essential oils you add to it. This characteristic makes HobaCare an ideal carrier or base for essential oils and perfumes. Adding essential oils to HobaCare enriches one's experience with the product, whether it is used for skin, scalp, hair, massage or any of the other applications described on this web-site. We always recommend that you mix your own essential oils with a base or carrier of your choice--as opposed to purchasing pre-mixed products--unless you're purchasing from Essence of Vali (www.essenceofvali.com). By mixing your own, you will know exactly what you have added to your base and in what strength. Please consult the National Association for Holistic Aromatherapy (www.NAHA.org) to obtain reliable sources for essential oils. Please consult our Bibliography to obtain additional information about Aromatherapy."